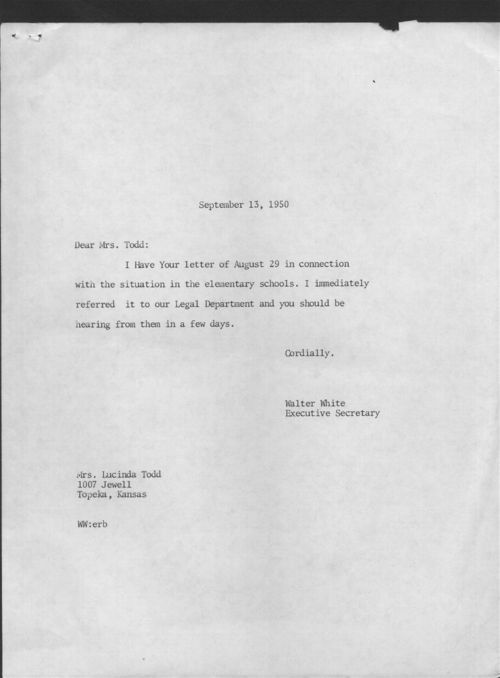 This Letter mentions the receipt of Todd's letter of August 29, 1950, about the situation in Topeka's elementary schools. White mentioned that he would immediately refer the letter to his legal department and said that Todd should expect to hear from him shortly. White's reply to Todd's letter can be used to help students understand how the Brown case began to take on a greater level of significance as the NAACP became involved in the matter. This letter can be used in conjunction with Todd's letter to White (#213405) and Todd's draft of the background to the Brown case (#213407).